"See, I can be hyper and cute at the same time." 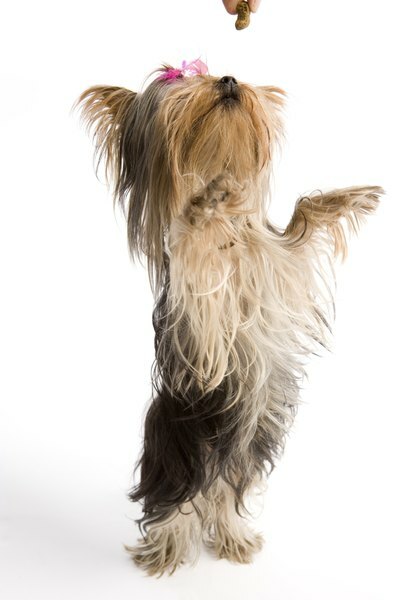 Glamorous and feisty, Yorkies make up for their size with their big personalities. At first look, they may look like delicate pooches crafted for pampering and snuggling, but those familiar with this breed know that many are blessed with quite vivacious spirits. Despite their elegant look, which makes them perfectly suitable for traveling in style safely tucked inside a designer handbag, Yorkies remain true terriers at heart. Their lively and inquisitive personalities drive them to seek out adventure. At times, their mischievous acts may get them in a bit of trouble. Bravado aside, these determined, investigative and energetic pooches remain one of the top most popular breeds, according to the American Kennel Club's statistics. Moving swiftly with light-footed grace, this breed was bred to catch rats in ancient coal mines, textile mills and factories during the Industrial Revolution in England. With a past as a ratter, Yorkies will chase anything that resembles a rodent. No obstacles in their way will stop them, even if it entails climbing a chain-link fence. After belonging to the working class for some time, the Yorkie left the workforce to become a pampered lap warmer for many aristocratic women in Europe. When no rodents are in sight, this adventurous breed with excitable chasing instincts, needs some form of exercise every day. The good news is that in spite of being energetic, Yorkies need a moderate amount of exercise to keep those hyper behaviors in check. Many Yorkies can and do live happily in an apartment. Because of their petite size, Yorkies have to take many steps to go a short distance, which means a brief walk speedily trotting around a block or two most likely will suffice to meet their exercise needs. Exercise aside, mental stimulation also may tire a hyper Yorkie. This spirited breed is quite easy to train, even though you may find the occasional willful and obstinate specimen. Being physically and mentally quick, several Yorkies enjoy the speed, thrill and action-packed fun of canine agility. Others are seen in conformation, obedience and freestyle competitions. You don't need to compete to tire a hyper Yorkie's mind; a few minutes of positive training each day may help. Be careful when picking treats; this breed can be finicky and some have delicate digestive systems. Just as people, no two Yorkies are alike. Even within a litter of pups, you may find puppies who are more on the hyper side and puppies who are calmer. At times, high-strung temperaments in some lines may pop up every now and then in spite of a breeder's efforts. Look for a reputable breeder who tests for genetic disease and screens for sound temperaments. When the big day then arrives, have the breeder help you pick the right puppy to take home. What Dogs Look Like Wolves?